The original Another Star’s limitations and theme of minimalism led to a lot of interesting decisions that defined it as a game. Some results were positive, such as the unique battle system. Others not so much so, like the strict tile limit for the graphics in a 20 hour RPG. A common sight in the first game. Player reactions to the towns in Another Star are possibly among the most divisive issues I come across in the game’s feedback. There are people who absolutely love the classic RPG town experience, and they live to seek out each and every NPC to hear what they have to say, no matter how mundane. For them, Another Star’s town menus were a major let-down. Others quite enjoyed the reduced “drive-thru” town experience. It was easy in Another Star to jump into a town, sell off your loot, rest, buy a couple slots worth of healing dust, and then jump right back out again, all without disrupting the game’s larger flow. But the menu-driven towns also had a wider, most curious side effect. Because I didn’t have to make any maps for them, it was very easy for me to add a complete town to the game. Very, very easy. As a result, Another Star has maybe a hundred individual towns, cities, and villages spread across its world. The starting area alone has a good twelve menu-driven locations you can visit (only two of which are hidden). Furthermore, because of the lack of maps or visible NPCs, each location could be as big or as small as it needed to be. Instead of a vast, sprawling metropolis of a dozen people aimlessly shambling back and forth down a single street, I could just say there were tens of thousands of people and be done with it. Because we never see them directly, from the game’s own descriptions the world of Another Star can be assumed to have a semi-realistic population count for its size and technology level. This affected the game and its story more than I think people realize. However, there were things lost in the trade-off. All these towns were reduced to flavor text. You could tell a location’s size by the relative number of huts it had on the overworld, but that was really all you actually saw of it. Every place was varied and unique, but you could only read about them and imagine what they must look like. In such a visual medium as video games, that’s kind of disappointing. It’s now getting close to the time for me to begin properly implementing villages and towns in the sequel, so I had to start really thinking about how I wanted them to work. Like with so many other aspects of the game, I decided that a simple mockup would be the best way to plan this. Tile limit? What tile limit? The first thing that needed to change was that we needed to see where we were. Adding a big graphic hits that nail right on the head. 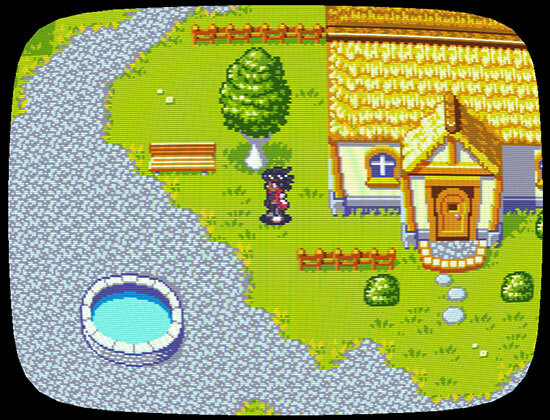 Just by looking at the mockup screen, without reading anything, you can tell the player is in a small-ish rural village. The power poles indicate that, even though they seem somewhat primitive from the thatch roofing, they have some level of advanced technology; a mix of medieval and modern that you’ll likely see a lot of in this game. Ideally each location would have its own, unique graphic, but it will all come down to how much work it is to do hundreds of them in a reasonable amount of time. Another thing I did was set the background to a nice blue color instead of pitch black. It makes the location feel more inviting, I think, although I’m not sure if every location would have the same color, or if maybe it changes from place to place. Finally, you’ll notice that the player character is talking about what they’ve come across. In Another Star, locations were described in the third person by a disembodied narrator. Another Star 2 is meant to be a more visual, active game, so I wanted to reduce the use of a narrator in places where I could instead show something, or have the characters themselves directly express something. Ideally, when you arrive at a location, you’ll hear from one of the characters instead of reading about how “Tachi did this” or “Tachi saw that”. 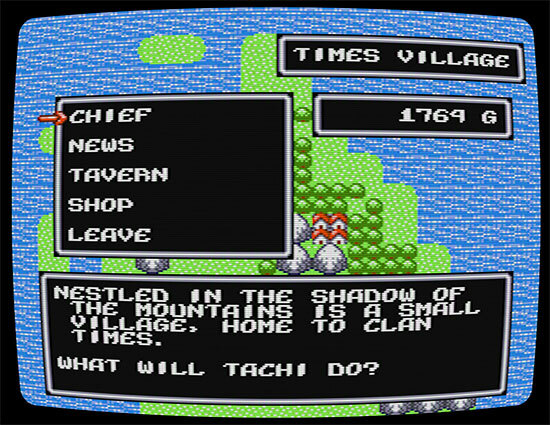 The menu itself hasn’t changed much, other than the fact the character now gives a short description of each location when you highlight it. Before you had to guess at the meaning of new or unique options. I have mixed feelings about how much real estate the menu is taking up in this mockup, but at least the player would have already seen the full graphic at this point. The “news” option returns, although I may spice it up a bit—more on that another time, though. The other options, “shop”, “tavern”, and “leave” should be likewise familiar. A small area of the village you can run around. You can’t randomly barge into people’s homes and steal their stuff as they compliment your heroics, and it’s only a very small portion of the village, so in a lot of ways I suppose it’s very much like the alternate solution I discussed earlier. However, not every location has a town square. This is a unique feature to this particular village. Other locations may have their own unique locations. I can import images into the game to preview them. Helps see what works in mockups like this. Perhaps every location will have a least one of these unique explorable areas? I don’t know yet. I’m still working to get my tools set up so that I can generate a lot of good content very quickly. How many of these areas get added depends entirely on how much trouble they are to get up and running. I’m of the faction that doesn’t like towns at all. Every time I reach a new town I feel like quitting, because it means running around every corner and talking to every NPC multiple times to make sure you don’t miss any secret quest or items. Many modern RPG have massive amount of dialogues too that are all completely irrelevant for the actual story. I find that super tiresome. Seeing your beautiful picture of a village, however, reminded me of Shining in the Darkness. In that game the town handling was pretty unique (watch a video of it if you haven’t played it). The only NPCs you could talk to where shop owners and some NPCs you find at the Inn and pretty much everyone told you something that is at least partly relevant either for the story or giving you a hint about future exploration. But at the same time it was so beautifully designed that it didn’t just feel like a menu list. One thing that manages to keep “normal RPG” towns interesting for me are secrets. Like if the town wasn’t only a bunch of NPCs to talk to, but is actually full of secret passages, starting from the “Enter the house through the backdoor, to be on the other side of the shop counter” trick over “Finding hidden treasure chests that get obscured by trees” up to “Move through the sewers to get to otherwise unreachable locations in town”. Stuff like that is much more interesting for me than a large number of text boxes presented to you all at once with hardly any gameplay in between. I’m of the faction that doesn’t like towns at all. Obviously, it’s a bit of give and take, though, because you don’t necessarily want said people to completely become background objects with no purpose other than decoration. Then it just feels fake. “Perfecting” the video game city is something that we have a long way to go to hone, I think. 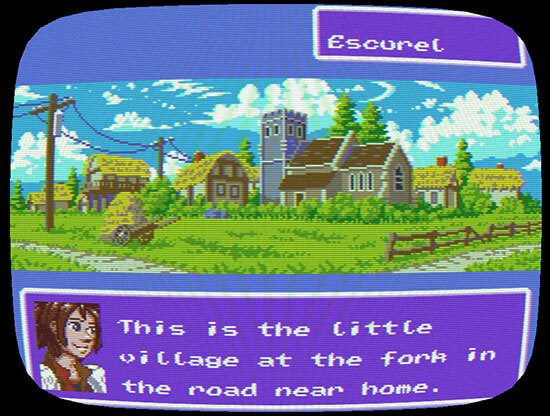 Menu-based towns were more prevalent in PC games, likely because you didn’t have the same crippling memory and space limitations as consoles, so you didn’t have to reuse overworld or dungeon code for towns if you didn’t want to. Microprose’s Darklands had some exceptionally intricate town menus going on. Another Star, both the original and its sequel, likewise have a lot of this cross-system and cross-genre pollination going on. Secrets in towns don’t usually make a lot of sense to me, though, so you’re unlikely to find too many in Another Star 2. (Well, unless it’s people’s hidden goods, I suppose, in which case you’re stealing, something the first game already established the gameplay wasn’t going to allow.) And unless you’re in the thief town or something, most people aren’t going to have secret passages in and out of their houses, so it’d be silly to add them all over the place. 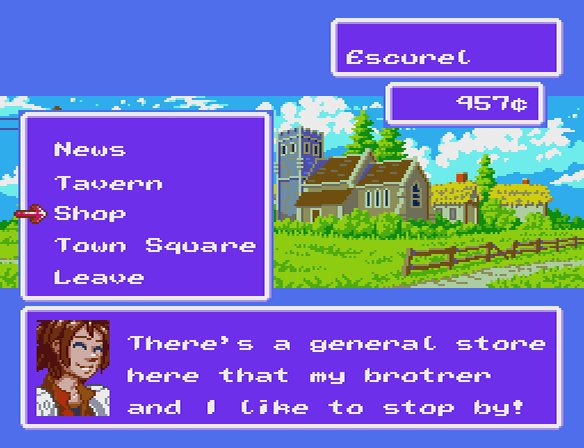 Oh yeah, that concept of filling towns with NPCs but not let the main character talk to all of them is a nice concept. I remember first seeing that in FFXII and thought “Why don’t all RPGs do that?”. I would even expand on that and have the main character really only talk with NPCs he has a reason to talk with. Like you might not be able to talk to an NPC at first, but if you later get a reason to talk to him, he suddenly becomes “clickable”. Y’know a charm of older games for me was that NPCs were rare and if you talked to them they really only said 1-2 lines of text and it still felt meaningful (“Nobody who went into the cave to the north ever returned.”). I’m still trying to imitate that myself, but so far, whenever I wanted to put story into my games I was writing so many lines of dialogue that I got tired of it, so I’m almost at the point of just not putting any story into my games, heh.